I was pleased to receive this award. The river has been a favourite place for us for 48 years of camping, boating, holidaying and playing radio. I have been conspicuously absent from activating in recent times. 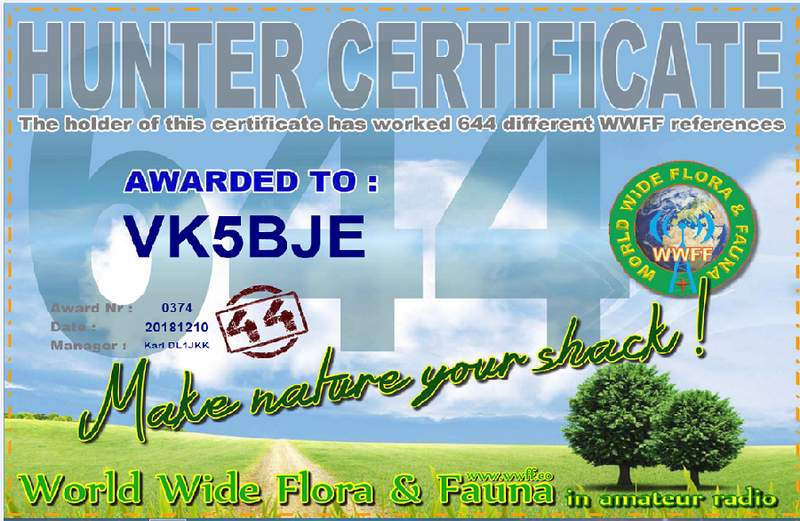 My last excursion was with Paul, VK5PAS, in November 2017. I do, however, hope to get back to visiting parks. I had a bit of a set-back in December and am not allowed to drive at present. I will be reviewed again at the end of March 2018. My previous review was this week. There is still a problem with the TCXO! In the meantime I am embarking on an exercise program, under medical supervision, to try and reduce the amount of Atrial Fibrillation. Many people have this condition and are not aware of it. So keep active.